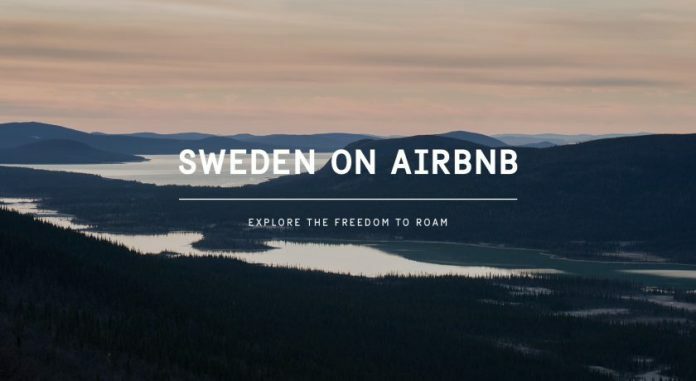 Sweden tourism board has partnered with Airbnb to turn the entire country into an Airbnb listing. This pact allows booking accommodation in Sweden entirely for free and accessible to everyone. The entire country is now included in the Airbnb booking of Visit Sweden. Effectively, the whole of Sweden is inclined as one big home rental, with 100,000 ‘infinity pools, clifftop terraces with panoramic floor-to-ceiling views, lakeside relaxation areas and bathrooms au naturel, designed after ‘minimalist Swedish style. Unlike other vacation rentals, there’s no need of booking or paying money. “Sweden has no Eiffel Towers. No Niagara Falls or Big Bens. Not even a little Sphinx. Sweden has something else — the freedom to roam. This is our monument,” reads Visit Sweden’s opening salvo. Swedish right guaranteed by the constitution has been made possible through the freedom to roam. Freedom to roam allows everyone and anyone to be free in the Swedish nature with the right to walk, access, cycle or camp on any land. Lands under cultivation and private land alone has got an exception from the rule. The great freedom comes the responsibility of Swede and the idea of free nature accessible to anyone. The general rule for spending time in nature is “do not disturb, do not destroy”, which is nothing but fair. “This is made possible thanks to a Swedish right guaranteed by the constitution – freedom to roam. This right enables the Swedish people to experience nature and enjoy the beautiful Swedish wildlife. In Sweden, we have everything from high mountains to deep forests, from beautiful archipelagos to quiet meadows. Now, together with Airbnb, we welcome everyone to Sweden and, through freedom to roam, they can share our wonderful nature”, says Jenny Kaiser, USA Country Manager at Visit Sweden.